When summer rolls around, we do anything we can to be outside. After all, being cooped up after a long winter makes us grateful for the warm weather again. Whether at work or school, you catch yourself looking out the window, waiting to be done for the day so you can step outside and enjoy the sunshine. Well, imagine not being able to enjoy the luxury of that. For some, it’s a nightmare to go outside because of severe problems that come with these warm summer months. Rhinitis is the inflammation and irritation of the mucous membrane inside the nose. The inflammation can be triggered by a lot of factors. Some of them include: viruses, bacteria, or allergens. When the mucous membrane is inflamed, symptoms such as a stuffy and runny nose, sneezing, and post nasal drip are very common. Since there are many different types of rhinitis, treatments vary. Rhinitis treatment typically includes antihistamine, decongestants, eye drops, nasal sprays and immunotherapy. One of the most common types of rhinitis is nasal rhinitis, also known as allergic rhinitis. Nasal rhinitis is triggered more by allergens, such as pollen and grass, than anything else. This type of rinitis usually targets those with sensitive immune systems. When the allergen is inhaled by the individual, the body will think it’s dangerous and start antibody production. Antibodies tend to bind to mast cells, which have histamine. When mast cells become triggered by an allergen, histamine is released. This will cause the mucus production and swelling to start. This condition is very tricky to diagnose because it’s difficult to tell the difference. Nasal rhinitis has the same symptoms as a common cold: a lot of sneezing, mucus in the throat, and a stuffy nose. It’s important to seek help with a medical professional to make sure you know your condition and what steps can be taken to help treat it. Treated improperly, nasal rhinitis can have unpleasant effects on the body like: fatigue, frequent headaches, and itchy eyes. Once you’re diagnosed with nasal rhinitis, you’re stuck with it. Sadly, this condition can’t be prevented just yet and tends to become problematic because the symptoms can last for weeks. For a person with rhinitis, all these symptoms can flare up just by going outside. While the treatment options previously discussed can be very beneficial, sometimes it just isn’t enough. Frequent use of medication can impact the body negatively. For starters, antihistamines and decongestants have potential side effects of mood swings, nausea, drowsiness, and dizziness. And if used often enough, larger doses of these medications will need to be used the more your body becomes used to it. Pretty soon, it won’t do much for you and you’ll still be stuck with the same irksome symptoms. These treatments also only relieve the symptoms temporarily. Although this condition isn’t a serious threat to the health, it’s never pleasant to be stuck with an on-going stuffed nose. A natural treatment that has been proven to help the root problem of this condition is salt therapy. Salt therapy is a non-invasive treatment that prevents rhinitis by addressing the core problem of it. Microscopic salt particles are released into the air, which you then inhale. The salt will essentially cleanse the respiratory system, making it very easy to blow or cough out the mucus that has become soft. Salt also contains anti-inflammatory properties, making the swelling in the air passages go down. Breathing will be much easier and take less effort, sneezing and coughing will decrease because there is less irritation in the lungs, and this treatment also provides immediate relief. With continuous use of salt therapy, the occurrence of rhinitis can decrease significantly. This treatment doesn’t just provide benefits for those with rhinitis. Even people without this condition can try out salt therapy. It’s safe for all ages to use and as an additional bonus, salt therapy also strengthens the immune system. With a more durable immune system, it’s even more unlikely to get rhinitis and even other conditions like bronchitis or the regular colds or flu. 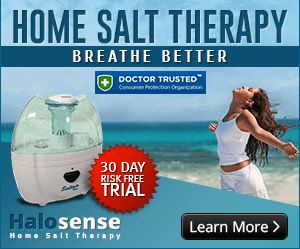 Another wonderful asset to salt therapy is that it is very cost effective. You don’t have to travel to salt spas for the experience. With the purchase of a salt machine, you can get the same effects right at home. The salt machine doesn’t take up a lot of space, so it will barely be noticed. It’s very easy to let a condition like rhinitis take control of your life. Well now is the time to put a stop to it. With salt therapy, you can get instantaneous relief and finally not have the fear of stepping out the front door. With a strengthened immune system and a much easier time coughing, sneezing, and breathing, you will feel unstoppable once again.